I think it is finally spring although only 50 today. 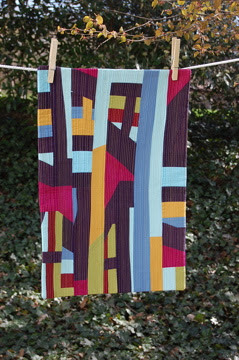 I was able to hang and photograph a completed piece on the clothesline. Amazing when you just devote 4 hours of time to one thing and focus. Looks like I have another project and that’s organize this years quilts names and labels. 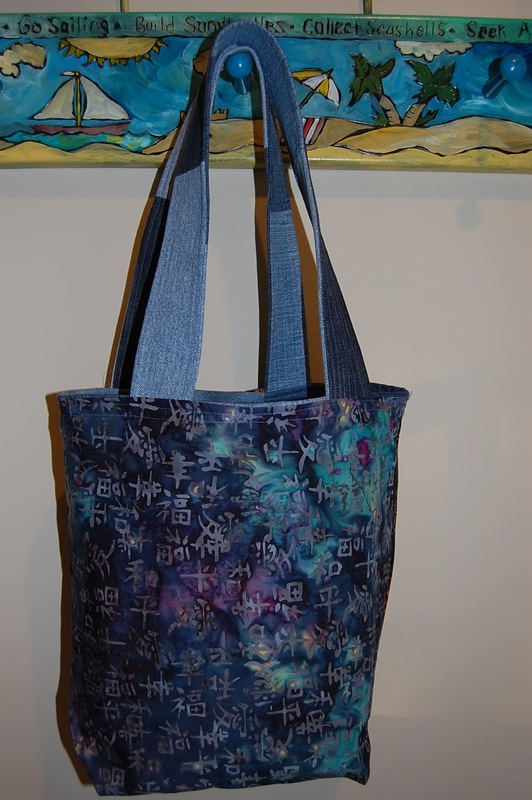 But I finished something even though it’s a small something! small. The road to completion recovery …. hope has arrived. 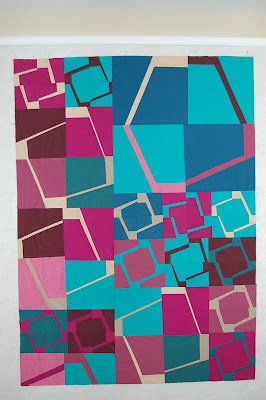 This entry was posted in L series, motifs, quilts 2011 on May 4, 2011 by Colleen Kole. I really wanted to put this piece away. But, I kept thinking and thinking about it. I will never really know until I just finish it. It may not be good or even great but honestly, it is in the completing of the design that I actually LEARN. 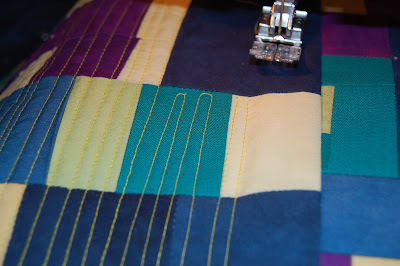 And the sewing together of the top. It started here. 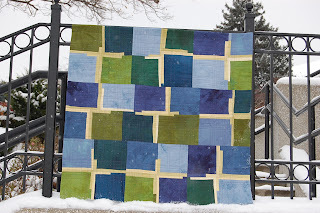 Random blocks that looked way too clunky for me. And dark. Didn’t like it. I had the whole piece up on the design wall and didn’t like it. So, changed it up adding another border around these “blocks”. mmm…that didn’t feel right either. cut some more. Realize I have driven myself and my family crazy. 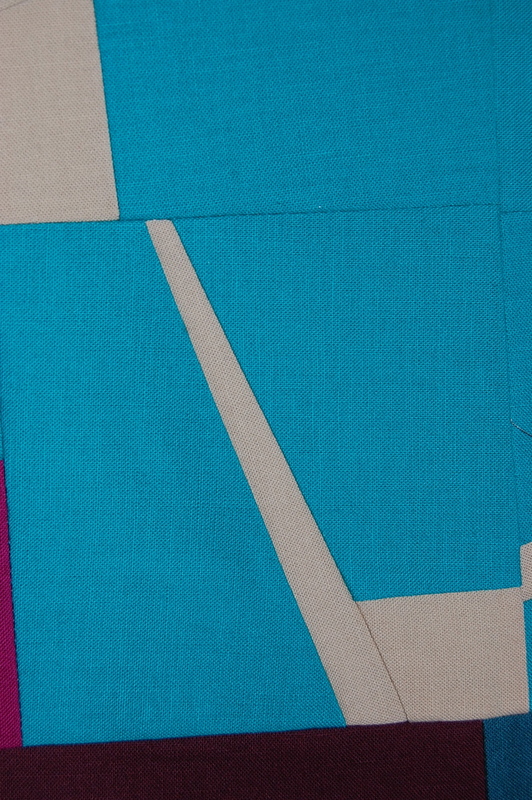 Now, procrastinate and make a small piece out of the scraps. And then get brave enough to start sewing it together-sewing numerous parts several times to get it to fit together. Finally, am down to the final seam. Big clunky part on the lower left doesn’t seam together right no matter what I try. What a mess that I am afraid to cut in to. No -let me re-phrase that- I don’t know what to do to make it work . Better recruit a friend who is a better seamstress to give me some advice today. This is quite the process that I am not sure I would tell anyone else but you how I got to this point. All this and I don’t even like it. Really I don’t at all. I just want to finish it. How crazy is that? 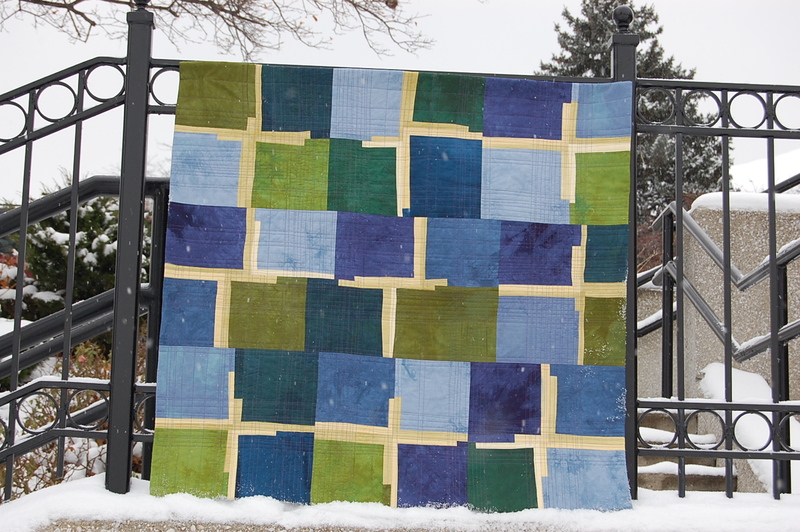 Now, maybe it just doesn’t need to be quilted but that I am not deciding today. It’s all a learning experience. 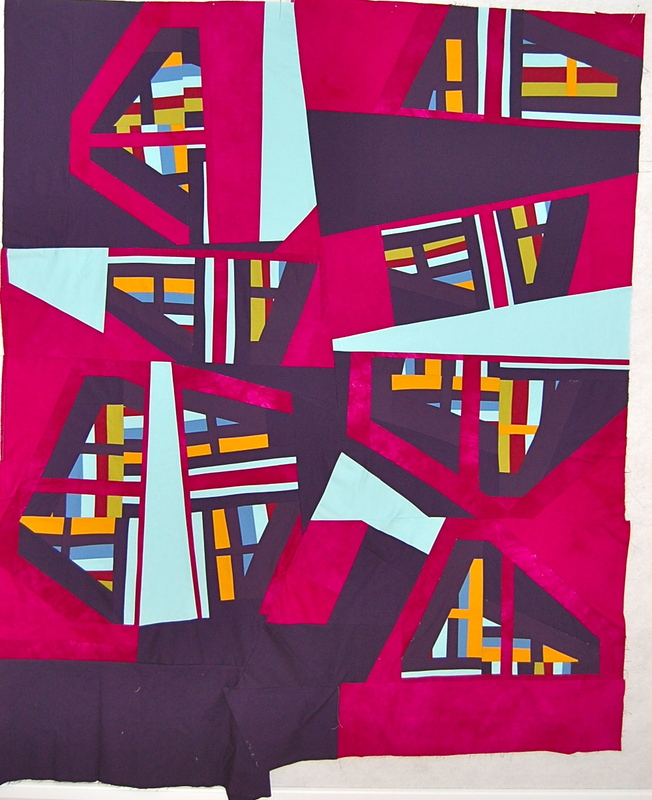 This entry was posted in L series, motifs, quilts 2011 on April 19, 2011 by Colleen Kole. First of all, thanks for your comments. I do worry and love hearing about everything-from progress, failures, illnesses, pets, vacations and what’s new in your studios. So, know that if you are gone for a time period, I am probably the friend who will send you an e-mail to check up on you! Well, back to what I am doing in my place. On Friday, I finished my next “L” motif quilt. All these blocks really were pretty boring to do but I did it . I went to my stash of Kona cotton solids-not much left but I want to use it up. So, I needed to use only what I had. No buying anything new in January. And then, I wanted to use a little less bold of color than I had been using. 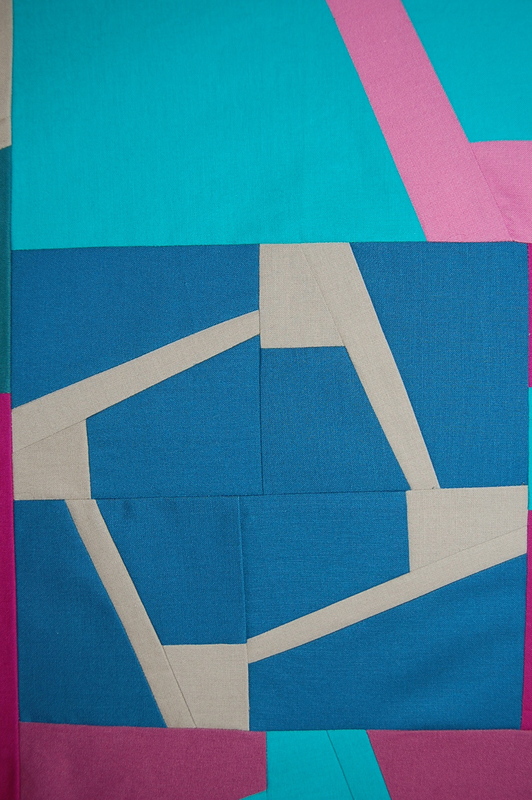 I didn’t want to make it look like a pink and blue baby quilt either. So a small challenge to myself. The further I got into it, the more I enjoyed how a block was looking on the design wall. And then it miraculously all fit together. ( I hate the math and just kind of estimated how big to cut it. I did cut freehand for the pieces but squared up the blocks.) And there she is…. Big. 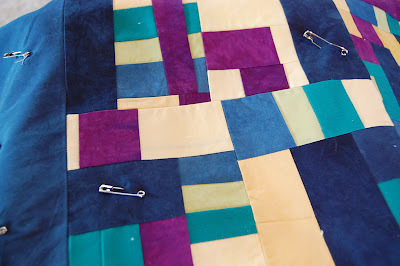 Lots of quilting to be done. But the absolute best-over the top exciting thing is -it’s sold. Will be SOLD – to my friend -an architect to hang in his office. Friends we went out with last night who just wanted to see what I was up to. He walked in and asked who I was making it for. Never expected that. More on the story tomorrow…I must start layering and basting. My friend asked me many questions I didn’t have good answers to. Artistic answers. I need to think about them, too. And do the work. Be creative, my friends! You never know where it might lead to. 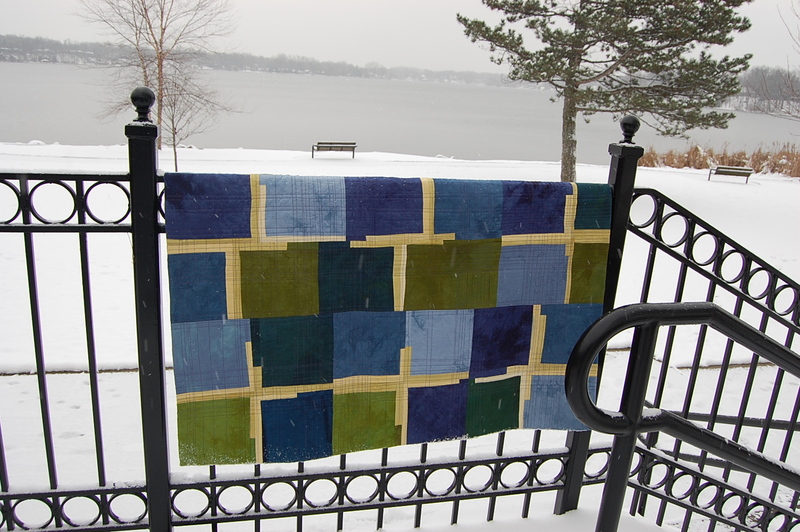 This entry was posted in L series, motif series, quilts 2011, working in a series on January 23, 2011 by Colleen Kole. If I have been reading a blog consistently and then the person is not there for a few days, I start to worry about them. Well, I do worry about alot of things so maybe this is no big deal, but I truly do worry about that person. Where are they? Are they ok? Did they just give up and stop creating? Or stop writing? Even if I have never met this person who is now a friend, of course, because I read about their life each day, I worry about them. (I really can’t believe I am rattling on like this right now. I am blaming my state of being on January.) But I take a vested interest in my blog artists out there. Selfishly, they entertain me and inspire me. So, stop working so hard out there that you don’t have time to stop and blog and tell me about how many wonderful things you are creating. Just let me know you are ok every once in a while. Otherwise I worry. I am doing something smaller next week as I need a hand stitching project to work on. I can’t believe how many people ask you about your work if you are just sitting and taking a few stitches. I hope you have a good weekend. Be creative, my friends and stay warm! 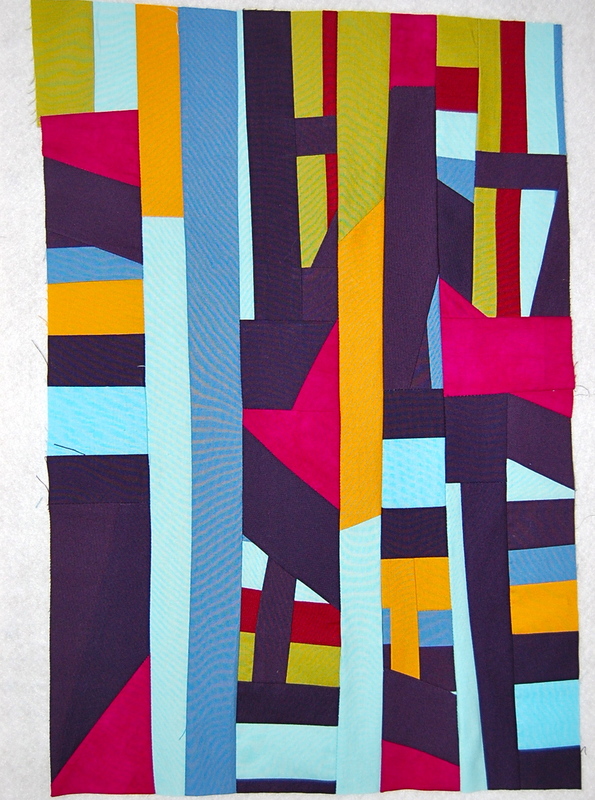 This entry was posted in L series, quilts 2011, studio on January 21, 2011 by Colleen Kole. It was the start of a series. I have a whole journal full of sketches surrounding this little simple ‘L” block. Many ideas -of where to go next. I started on it this summer and the top was done. 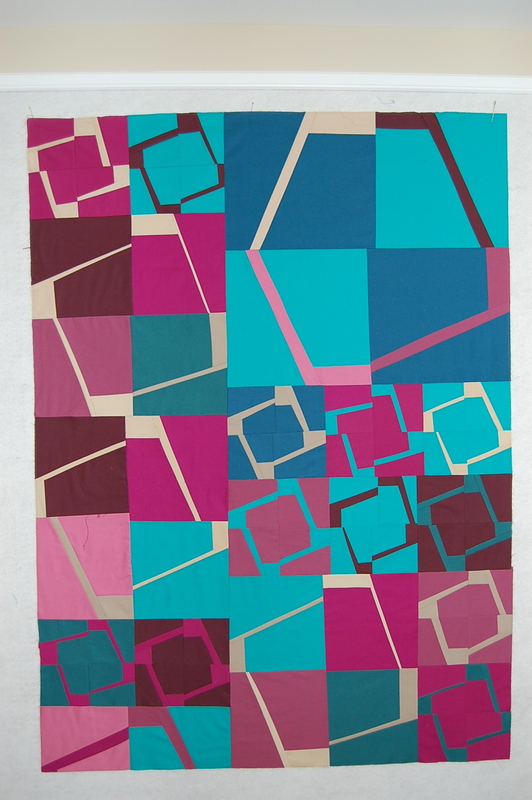 When I started quilting it , the machine started chewing it up and I kept fighting with the machine. Which led to a new machine. 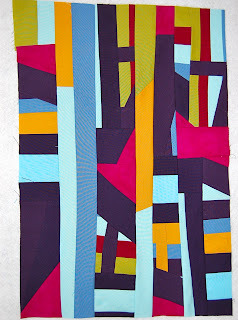 I ripped out bad stitching for about 10 hours and then, left it in a heap in my workbasket. 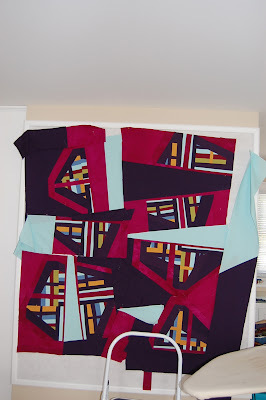 I was left with a stretched out quilt top that I really didn’t want to finish. But if I wanted to keep a record of the first in the series, it had to be finished. I needed to let go of perfect and finish it. And it’s done. It will be for a room in my home. It can still be beautiful even though it’s not perfect. 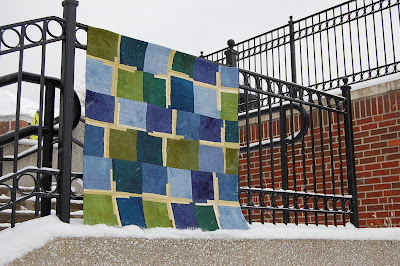 This entry was posted in L series, motif series, quilts 2010 on December 2, 2010 by Colleen Kole. Can’t stay and chat today. The whole focus thing is really hard for me. I much prefer the chatting and stopping to see how you are. The basting on the beast. The beast is being quilted. I am getting some weird u-turns where instead I would like crisp square corners. I don’t know what I am doing differently but it seemed a good place to stop. Just a little lack of focus…and a distraction last night. See how hard this focus is for me? 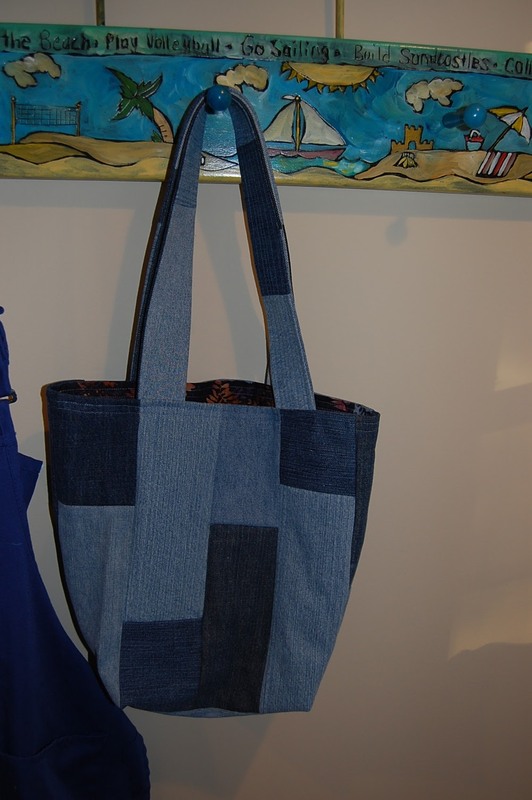 This entry was posted in L series, quilts 2010, recycled market bag on November 17, 2010 by Colleen Kole.